SABMiller, the world’s second-largest beer company, has strategically ventured into Cassava Beer Aimed at Beating African Homebrews in a territory that has unmatched unquenchable thirst for alcohol. SABMiller wants to cash in on Uganda’s oil boom, and knows very well that many oil deals will be done over a beer. When you are in brewery, there is no better place to go than “The Drunkest Place on Earth“, especially when government is to promote the growing of raw materials for your industry. As I read – ” Government is to promote the growing of cassava to help substitute barley in manufacturing industries”, I think of a few reasons for such a statement; the first one is money from Bill and Melinda Gates foundation in exchange for Developing Genetically Modified Cassava in Sub-Saharan Africa. The other one is to promote cassava brewery industry for taxation revenue in addition to getting Ugandans drunk cheaply as we get closer to elections. Either way, this recipe of a philanthropist, a brewer, the government and cassava fermented in “The Drunkest County of the world”, will sooner rather than later cost poor citizens in more ways than one. Ugandans—at 19.47 liters per year—out-drink all other nations. –Barley’s Health Benefits outstrip those of Cassava’s, yet it is being sidestepped. 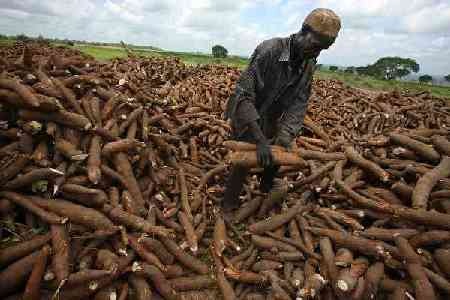 -Uganda promotes cassava over barley and WHO lauds her over nutrition drive!